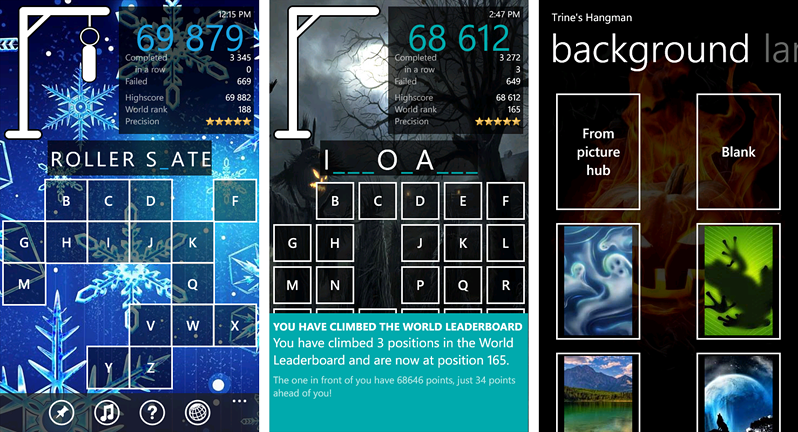 This week's Roundup deals with Go To Games for your Windows Phone. For the lack of a better term, Go To games are the ones that always find their way on to your Windows Phone and really never grow old. These games are amongst your favorites but always seem to rise to the top of that list. They are the games you go to for entertainment that are great time wasters that never disappoint. The Windows Phone Central staff were polled on which two gaming titles are their Go To Games. We see a lot of games come and go on our Windows Phones but these titles seem to always be around. The Roundup contains a wide range of games that include a beauty salon, chickens and rainbows as well as a healthy selection of Xbox Live titles. ORB (free version/$1.29): ORB is a challenging fast paced game for your Windows Phone where you have to navigate a rolling ball through a maze of tiles and avoid various pitfalls along the way. The rolling ball is controlled by your Windows Phone and the goal is simple. See how far you can go before your ball falls off the grid. Along with dangers you will run across tiles that will help you along the way such a fan that will give your ORB a little lift to fly over large gaps. ORB is a wonderfully drawn out game that will keep you on your toes. 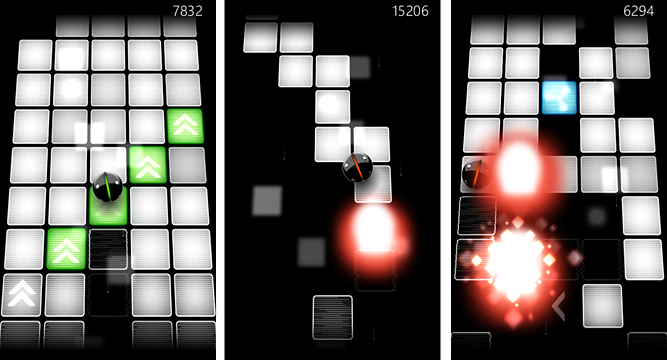 There are two versions of ORB available over at the Windows Phone Store. You have ORB Free that is ad supported and a $1.29 ad-free version of ORB. 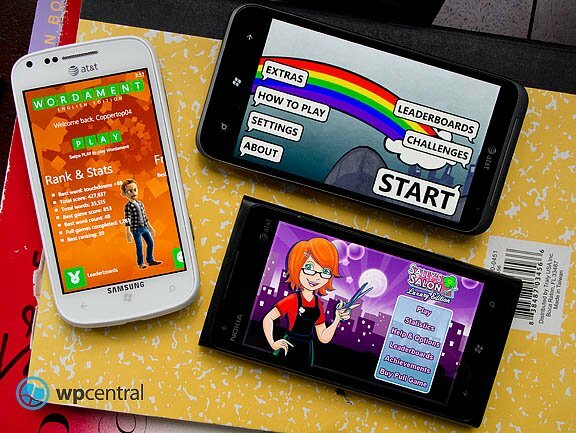 Wordament (free): Wordament started out life on the Windows Phone Store as an independent title. Then Microsoft extended the invitation to have the word puzzle game become an Xbox Live title. 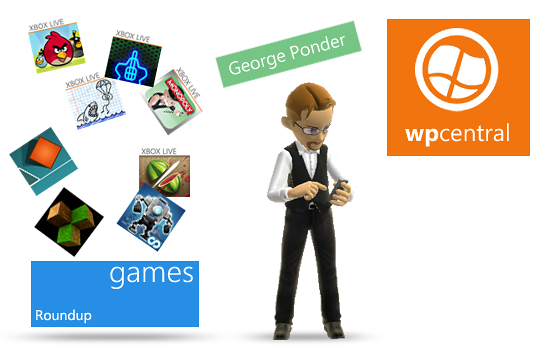 Wordament was always a popular game but with the Xbox Live branding, it only became more popular. For those not familiar with Wordament, it is a Boggle-styled word game where you have to create words from a 4x4 grid of letters. Game play consists of two minute rounds and you compete against other players (who are tackling the same puzzle) to see who can score the highest. Every board is guaranteed to have over 100 possible words and is great for short spurts or marathon sessions. Just be careful, Wordament is a highly addictive game that you'll catch yourself saying "one more game and I'm done" repeatedly. 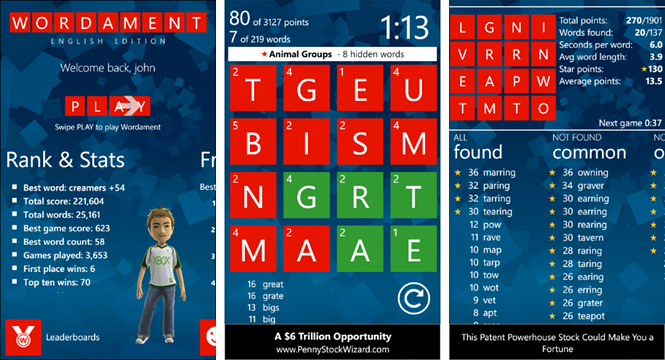 Wordament is a free, ad supported game that you can find here at the Windows Phone Store. Penguin (free): Penguin is a Windows Phone game we highlighted in the Slider Game Roundup a few weeks ago. Penguin is a great time waster that really doesn't get stale. You play the role of the penguin and have to see how far you can slide, jump and fly across the frozen tundra before time runs out. Along the way you can gobble up fish for a boost of energy and the longer you spend in the air, more time is added to the timer. There's not much to Penguin but it's has nice animations and you can't help but mutter "weeeeee" under your breath when the penguin catches big time air. Penguin is a free, ad supported game that you can catch here at the Windows Phone Store. Sally's Salon LE (free trial/$2.99): Sally's Salon is another Xbox Live titles making its way on to this week's Roundup. It's a time management game where you tackle all the trials and tribulations of running a salon. The Luxury Edition is described as the ultimate makeover of the original game that includes five additional locations that includes more challenges, customer types, trophies, graphics, and visual effects. There is a free trial version of Sally's Salon LE available with the full version of the game running $2.99. You can find Sally's Salon LE here at the Windows Phone Store. Oh and in a related item, Sally's Spa was also among our staff's go to game choices. Sally's Spa is also an Xbox Live title and takes Sally's time management challenges out of the salon and into the day spa. Sally's Spa also has a free trial version while the full version is currently running $2.99. You can find Sally's Spa here at the Windows Phone Store. Final Fantasy (free trial/$6.99): Final Fantasy has been around for a long time (1987) and has come to our Windows Phone as an Xbox Live title. You guide the Warriors of Light as they set out to restore the crystals through a series of quests. The role playing game is well animated and an interesting way to pass the time. If you're into scouring dungeons and battling monsters Final Fantasy may be a good Go To Game for your Windows Phone whether you only have time to take out a few monster or are looking for a marathon dungeon quest. There is a trial version that has limited game play with the full version of Final Fantasy running $6.99. You can conjure everything up here at the Windows Phone Store. Relaxify X (free trial/$.99): Not sure if Relaxify X qualifies as a game but it is a neat time waster of an app for your Windows Phone. 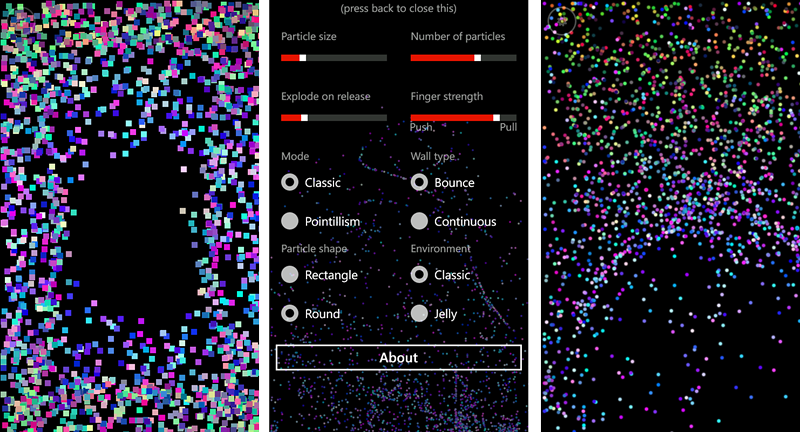 Relaxify X is a particle simulator that you manipulate by touch. There's really no rhyme or reason on how to play Relaxify X. Just use your imagination to tap, swipe, and touch the screen to see what you can get the pixel particles to do. The trial version will spark your interest but doesn't allow you access to the settings. The full version will run you $.99 and let you change the particle shapes, the environment, whether or not the particles bounce off walls or move continuously, as well as other environmental settings to keep Relaxify X from growing stale. Again, it's a neat time waster. Just not too sure I'd call it a game. You can find Relaxify X here at the Windows Phone Store. Chickens Can't Fly (free trial/$.99): Chickens Can't Fly is an Xbox Live game for your Windows Phone that has you guiding a chicken as it falls down a collection of obstacle courses. The story line has you playing the role of a scientist to see what chickens are capable of through a series of experiments (or obstacle courses). As you control your chickens descent you'll have to avoid the dangers such as fan blades, kitchen utensils, saw blades and other items that will just ruin your chicken's day. You collect corn for points and the goal is to land safely at the bottom of the course. The game has five different laboratories and over fifty experiments that are full of challenges. Prefer free form play? There's a Survival Mode that tests how far you can drop your chicken without getting plucked. Add a free Chickens Can't Fly ringtone and customizable skins to give your chicken a more personal touch and you've got a healthy go-to game. There is a limited trial version (only one level of play) and the full version of Chickens Can't Fly will run you $.99. You can find Chickens Can't Fly here at the Windows Phone Store. Lode Runner Classic (free trial/$2.99): Lode Runner Classic brings the classic 1983 video game to your Windows Phone as an Xbox Live game. You play the role of the Runner who tries to stay one step ahead of pursuing enemies as he navigates through 150 levels of game play. Lode Runner Classic has two game modes, Expedition runs you through the game level by level while Time Attack adds a game clock into the mix. With the retro look, Lode Runner Classic should appeal to most gaming enthusiasts. There is a free trial version with the full version of Lode Runner Classic running $2.99. You can find it all here at the Windows Phone Store. 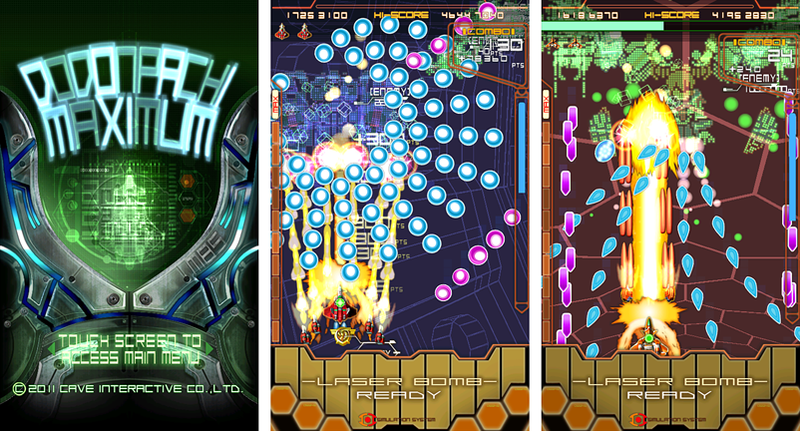 DODONPACHI MAXIMUM (free trial/$4.99): DODONPACHI MAXIMUM IS A MULTI-STAGE SCI-FI XBOX LIVE SHOOTER FOR YOUR WINDOWS GAMES. YOU DODGE YOUR SHIPS THROUGH (sorry cap lock got stuck) waves of enemy fire, collecting boosts along the way. DODONPACHI reminds me of Impossible Shoota just with a little more gusto. Animations and graphics are no slouch with this game and fast paced might be an understatement. As an Xbox Live title you have Xbox Live achievements and leaderboards. If you like games such as Galaga Legions DX or Impossible Shoota, DODONPACHI MAXIMUM should have equal appeal. There is a trial version available with the full version running $4.99. You can find DODONPACHI MAXIMUM here at the Windows Phone Store. BulletAsylum (free trial/$2.99): Where DONDONPACHI MAXIMUM is a fast paced sci-fi shooter where you pilot a space ship, BulletAsylum is equally as fast paced but you command a base station. You control your guns simply by tapping the screen around the object you want obliterated. 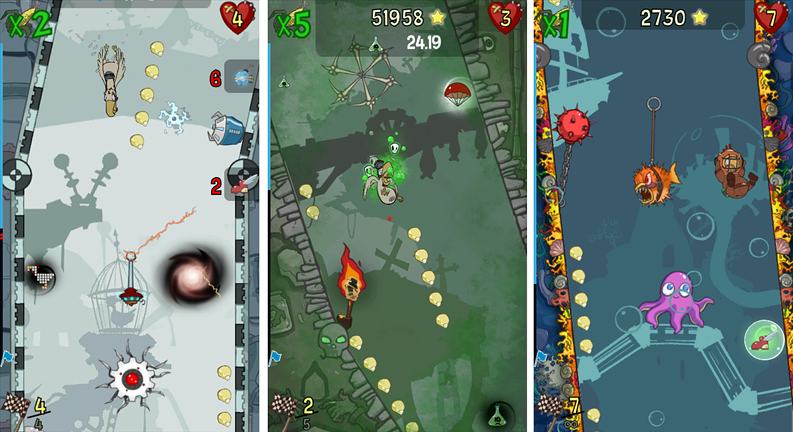 BulletAsylum has three game modes (arcade, survival, and architect), twenty five weapons upgrades, and seven game modifiers. Game modifiers allow you to change the rules of the game. For example you can purchase the Battle Cry which slows the game speed in half. BulletAsylum is a well animated shoot-em up game that isn't a bad way to pass the time. There is a trial version available that is limited to the arcade mode. The full version of BulletAsylum is currently running $2.99 and you can find it here at the Windows Phone Store. Rainbow Rapture (free version/$1.49): Simply put, Rainbow Rapture is a great time waster. You play the role of the rainbow who is fed up with society and decides to take his frustration out on humanity. You slide, jump and soar taking out little stick people and vehicles along the way. The primary goal is to see how far you can travel before you run out of energy. You can recharge your batteries by soaring higher and longer while maintain a steady diet of humanity. There are forty-five secondary challenges to take on as well as bonus wallpapers and ringtones with the paid version of Rainbow Rapture. Animations and graphics are well drawn out, the game is challenging, somewhat addictive and a very enjoyable way to pass the time. Two versions are available over at the Windows Phone Store. You have Rainbow Rapture Free which is ad supported and Rainbow Rapture that is running $1.49 and is ad free (plus it has the bonus wallpapers and ringtones). Mush (free trail/$2.99): Mush is an odd sort of Xbox Live game for your Windows Phone that does have a tendency to grow on you. You have to navigate a furry little creature, that would be Mush, through multi-level worlds in a game of hide and seek. Mush is controlled by tilting your Windows Phone this way and that along with a series of twelve emotions that give Mush special abilities (e.g. drawing a smile makes Mush float). Mush is a wonderfully drawn up game and the mazes of each level can be rather challenging. Mush is an Xbox Live title with twenty Xbox Live achievements to earn. There is a free trial that is limited to the first level of the game and the full version of Mush is running $2.99. You can find Mush here at the Windows Phone Store. Trines Hangman (free version/$.99): If you like word games, Trines Hangman should be on your short list of Windows Phone games. Trines is a game of hangman that you play for points and compete against other players for leaderboard position. You begin the game with seven misses (hangman parts) when solving the puzzle. As you move up the ranks and scoring level your possible misses reduce. Add twenty two wallpapers to customize the game's appearance, free ringtones and some really challenging puzzles and Trines Hangman turns out to be a nice Windows Phone game to pass short bits of time with or play for an extended period. There are two versions of Trine's Hangman available over at the Windows Phone Store. You have Trine's Hangman which is a free, ad supported version. Then there is Trine's Hangman Pro which is currently running $.99 and is ad free. There were a few duplicate responses with Wordament, DODONPACHI MAXIMUM and the Sally series appearing to be the most popular amongst the WPCentral Staff. All make for great Go To games as do other Windows Phone gaming titles. Now it's your turn. What is you're Go To game? Could it be Doodle Jump, ARMED!, Impossible Shoota! or Line Birds? Sound off in the comments and let us know which game is your Windows Phone Go To game.